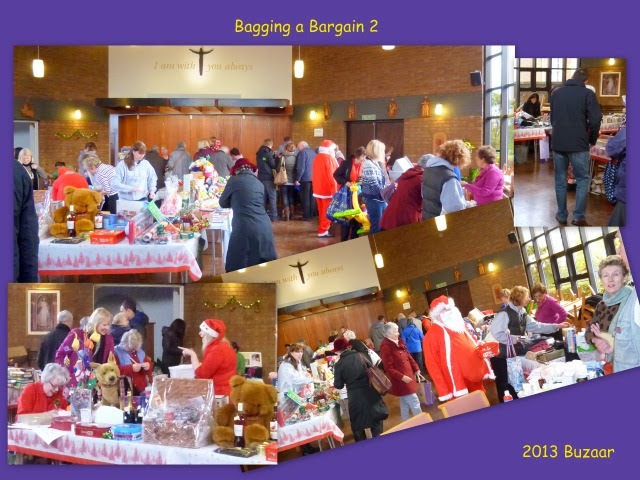 The 2013 annual Parish pre-advent Bazaar was a great success and has raised more money than ever raising £2059.30. This, notwithstanding the 21 confirmandi and teachers and some family groups, plus Fr Richard fleeing off just beforehand for their fun event trip to Buckden Towers. None-the-less the Church was filled with stalls and fun things for people to do. 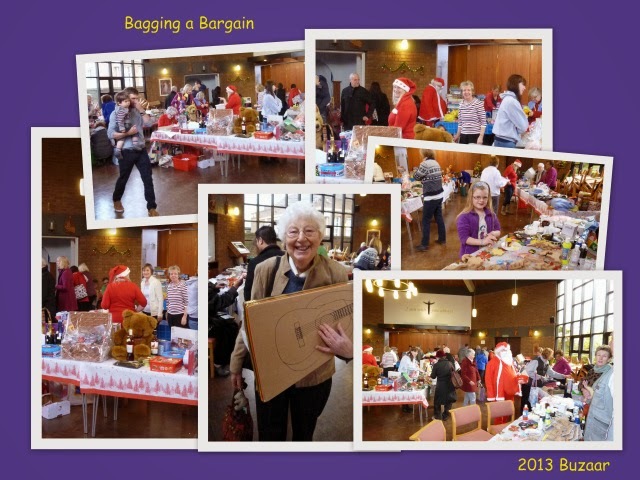 Hoards of parishioners and non-parishioners alike came flooding through the doors to see what was happening and pick up a few bargains - or not - as the case may be. I believe most people enjoyed the event - even those stuck behind the stalls too.... Here's a few photos that I took which I hope captures some of the atmosphere. Tickets: £10 Adults / under 16’s £7. So please join us and have a great night out. The entertainment and food are included in the price and a full bar will be available too. 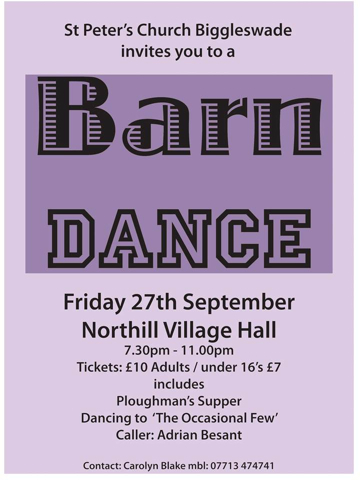 Everyone is invited and if dancing doesn’t appeal, just come along and enjoy the fun of the evening and see others attempting to follow the barn dance steps and have a great laugh. Tickets are for sale on a first come first served basis – so don’t be caught out (no tickets will be sold on the night). 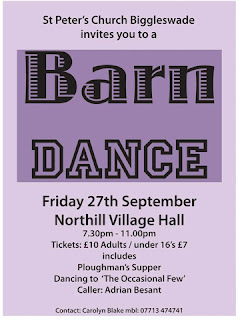 And if you don't know what a Barn Dance is then click here and play this video for a little taster. See Brenda's post below as well . . .
• Good quality "preloved" items. • Cakes, bottles and other luxury consumables. • Items that you would like someone to give you. The Committee also needs help with setting up, manning the stalls and taking it all down. Please contact Claire on 222572 to volunteer for part (or all) of this endeavour. And don't forget to come and enjoy the Bazaar on the day. There will be delicious snacks, including jacket potatoes with lovely fillings that you won't want to miss! St.Peter’s Catholic Church Biggleswade, Last Sundays gospel was from Mark 10:46-52. This gospel informs us of the miracle that Jesus performed when He restored the sight of the blind beggar. All through this scripture unlike previous gospels Jesus did not correct the disciples; there was a reason for this. The gospel says, Jesus is heading for Jerusalem, he had just left Jericho that was about 15 miles north east of Jerusalem a major crossroads where travellers and beggars to meet from all other directions to lead into Jerusalem, and although not mentioned, Jesus was heading towards His Passion (the crucifixion and resurrection). Jesus knew this but the Disciples were not aware of how close they were to this event or fully comprehended what it meant. There are several reflections within this text. One being the referral to a beggar, an image of great faith, a faith that overcome huge obstacles; in this instance the Disciples who prevented him from reaching Jesus. The beggar was Bartimaeus, being the son of Timaeus; Mark used this name and linage as a metaphor for all of those outside of the faith, those who did not have the full insight into Jesus, the model of all those who are marginalized, forced to beg for mercy while the great ones of the world pass by. This was endorsed when Mark mentioned that the beggar was found sitting ‘by the way’, in this time people who believed in God and Jesus called themselves ‘members of the way’. Therefore, as Bartimaeus was found beside ‘the way’ this meant that he (or they) were not yet members. Through this metaphor it can be perceived that there was also a contrast between Jesus ‘The Son of David’ from royal lineage and Bartimaeus being the son of Timaeus being of no importance or statue. Therefore through Jesus’ mercy by reinstating Bartimaeus sight He transformed Bartimaeus life rather than just solving a problem. Shared Supper & Social Evening-Friday 2nd November 7.30pm, please bring a plate of food (1 plate only please & indentify to ensure its returned). An opportunity to meet with our new priest Fr. Richard Moroney and with old friends, entertained by local choir T.A.G.S. 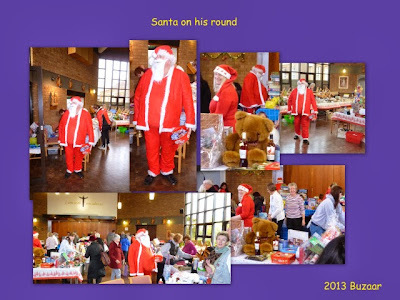 Sponsored bike & hike Many congratulations to Andrew Kluth who raised £343 for the Beds & Herts. Historic Churches, ½ will go to St Peter’s. Thank you to all those who sponsored. 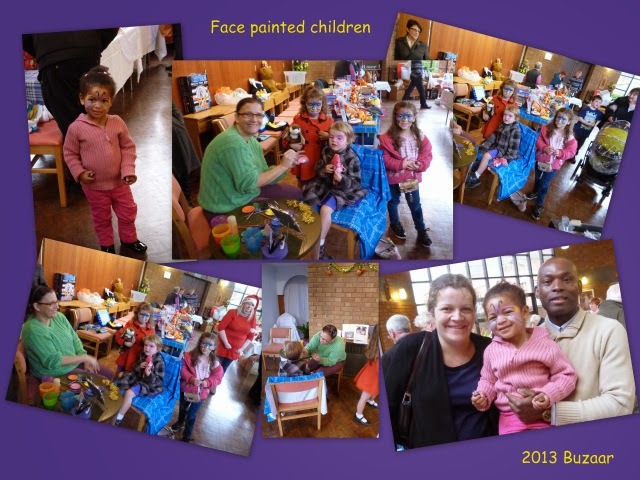 Coffee Morning Saturday 17th 10.30-11.30 am Invitation to meet Fr. Richard and chat with friends. I am sure that you have noticed the sheets of paper spread about the Church, asking for help with the Christmas Bazaar, but perhaps you feel that you wanted more details before volunteering to help. Let me give you some dates and times, and then perhaps, you can allocate some of your time. On the evening of Wednesday, 23rd November, at 7pm, people will be in the “Basilica” (the long hut beside the car park), to sort out donations. On Thursday, l 1st December, after the 9.30am Mass, we will move the chairs and kneelers, and bring in the big tables, and that evening at about 7pm, we will be filling the tables. On Friday 2nd December, Mass will be celebrated in the Sanctuary behind the folding doors. After Mass is finished, we will continue to sort, separate and prepare for the next day as well as decorating everything, while the Market Square lights are being switched on. 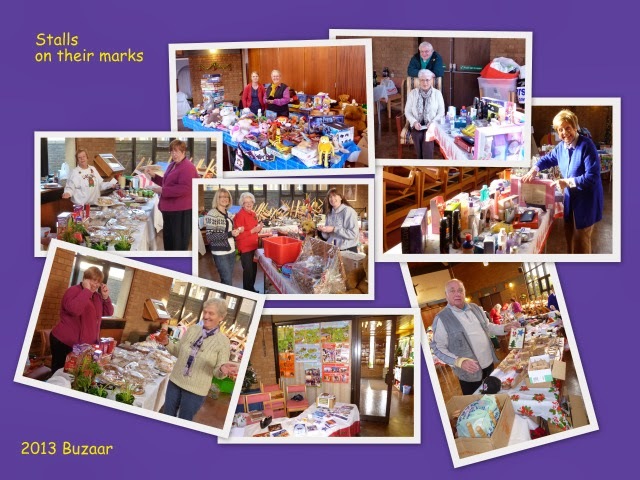 On Saturday, 3rd December, about 9am, we will tie the Bazaar notices to the railings nearby, prepare the potatoes and other food in the clubroom and wait for the fresh cakes to be brought in. 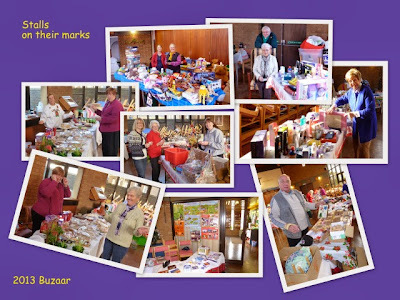 At 11am our local MP, Alistair Burt, will open the Bazaar, which is when we will need help behind the stalls. At the end of it all, some unsold items will be put back in the “Basilica” prior to recycling. 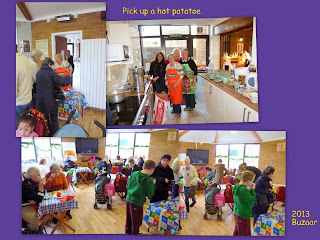 The floor has to be swept, the money counted, and all the furniture replaced ready for the 6.30pm Mass. We would be very grateful if you would talk to us about helping, even If it is something you have never done before! There’s a FAB day (Fairtrade Association Biggleswade) next Saturday, 7 March at the Baptist Church in Biggleswade. It’s a day to raise awareness of the things that you buy every day for yourself or your family. There are loads of interesting events (see the poster below) so it should be a great day to enjoy as well as supporting Fairtrade around the world. Kodzo Selormey, a volunteer with the Society, was at Church today talking about the Society and its work. He emphasised that the work continued, notwithstanding its move away from the Catholic Church because of new laws governing adoption agencies. He thanked the Parish for its support over the years and asked us to continue that support: by considering adoption, providing financial donation and by praying for the Society and the children that it helps.